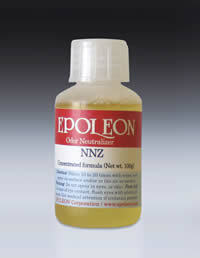 Epoleon NnZ offers a catalytic deodorizer for pesticide odor, chemical odors, and odors from other types of chemical solvents. NnZ has a special inclusion effect which deodorizes the traces of gases and neutral odors which cannot be analyzed (indole, skatole, etc). NnZ contains an emulsifier for oil and grease and has excellent cleaning power. NnZ is a non-staining fragrance-free product which can be used in carpet cleaning, pesticide, termiticides, disinfectants and other cleansers. NnZ is authorized by the USDA for use as a general cleaning agent on any surface and contains emulsifying agents which breaks up grease and oil. It is listed as a cleaning agent under"Proprietary Substances and Nonfood Compounds.